During the early years of Kingston Penitentiary, labour was thought to be a key element in the reformation process. It was felt that hard work and industry were necessary in order to instill discipline and character into the inmates that would enable them to live an honest life. Upon arriving at the penitentiary, each inmate received a job assignment. Inmates were employed in a variety of occupations: in the kitchens, stone quarrying and cutting, carpentry, leatherworking, oakum picking, metalworking, shoemaking and general housekeeping. Inmate labour was used to construct most of the buildings for the penitentiary. Outside contracts for cut stone were also fulfilled through the stone-cutting sheds at K.P.. Numerous buildings throughout Ontario and the northern United States were built using K.P. limestone including the Presqu’ile Lighthouse at Brighton and the McKenzie Block of the Royal Military College. Inmate work gangs were also responsible for the construction of Rockwood Asylum, the Prison for Women, Collin’s Bay Penitentiary and the Warden’s Residence. 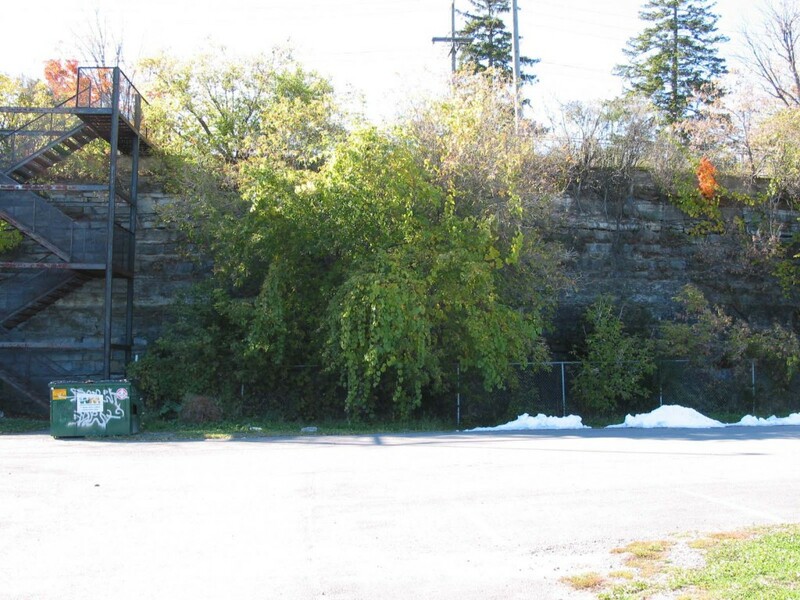 This site is the location of the last quarry worked by prisoners at the Kingston Penitentiary. Standing beside this rock cut can give you an idea of how deep the limestone was quarried. Limestone was quarried in the area from 1833 until 1945. For the first twenty-five years, limestone was quarried directly on the site of the prison for use in building the penitentiary itself. In later years, inmate quarry gangs left the institution daily to work in several nearby quarries, of which this was one. These particular gangs were occupied with extracting rough blocks of stone as well as in the production of lime, which was used to make cement for building. 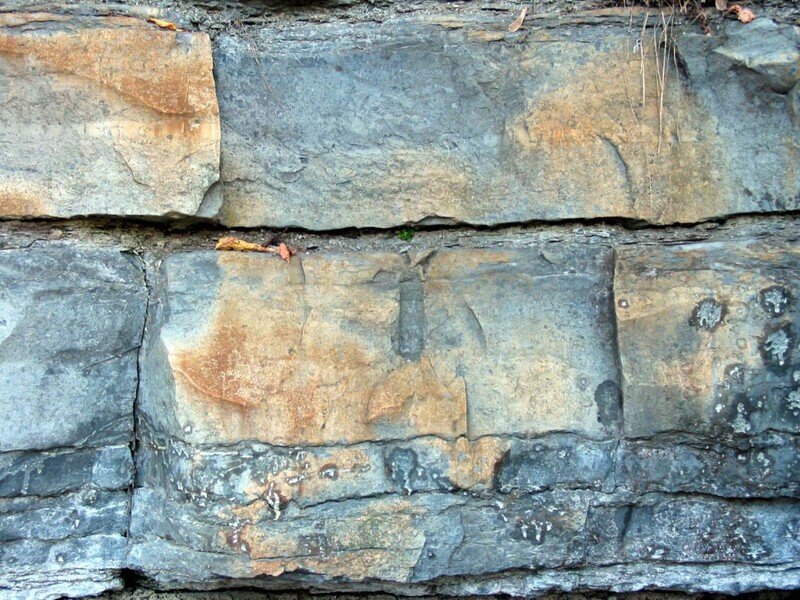 As a sedimentary rock, limestone naturally occurs in layers that range in thickness, allowing the stones to be removed in blocks suited for building. The quarrying of building stones is a process that was carried out by hand by in the nineteenth and early twentieth centuries. First, all dirt and debris had to be removed. After this, the layers of limestone were exposed and some layers could be removed by hand. Other layers required holes to be hand drilled. Into these holes metal wedges called “plugs and feathers” were inserted. These were used to force the stone to separate into blocks. If you take a closer look at the rock cut, you can see drill holes in the stone. This was not the only prison quarry in the region. There were several other locations in the area as well. Those prisoners who were assigned to quarry duty would leave the prison each day for work, except for Sunday. They would be marched through the village in ranks of two until they reached their worksite. Inmates of Kingston Penitentiary worked outside of the prison walls until 1963. At this point the village of Portsmouth had expanded and development overtook the prison farm and quarries. In the early years of the penitentiary, inmates were also involved with contract labour. This enabled outside manufacturers to move their production facilities within the walls of the penitentiary and use prison inmates as their labour force in exchange for a small fee per man, which was paid to the government. This was considered an excellent situation that profited the penitentiary, by engaging the prisoners and generating revenue for the institution. Manufacturers also benefited, as they were able to access a large pool of cheap labour. From the beginning of the prison’s conception, it was hoped that contract labour would employ the majority of prisoners. This fit with the popular idea of prison reform at the time, the convicts would be kept occupied, learn new skills, and pay for their own upkeep. However, many local businesses felt that this access to cheap labour gave some businesses an unfair advantage over others. Articles in Kingston newspapers from the period attest to the debate that ensued. The first contracts commenced in 1849. These included shoe manufacturing, cabinet making, tailoring and blacksmithing. These manufacturers sold their products on the open market in retail shops in Kingston and other cities such as Hamilton. Contract labour existed in Kingston Penitentiary until about 1880. After that prison workshops were banned from competing on the open market and were only allowed to manufacture wares for government use. Kingston Penitentiary continues to employ its inmates in a variety of occupations ranging from the general operation and maintenance of the institution itself, to government contract work through CORCAN Industries.